This is the fourth of four posts based on the account book from Blackhall that covered the years 1863 and 1864 with a few months of 1865 at the end. 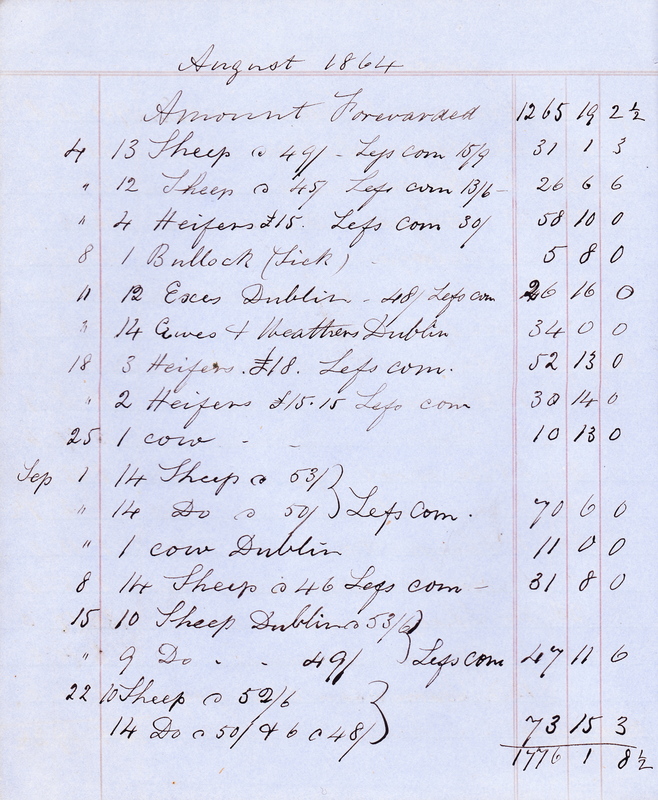 This post is focused on the trading in livestock and other farm products that Thomas Smith engaged in soon after he moved to Blackhall in early April 1863. Remember that the prices paid for commodities, including livestock, in today’s world are estimated to be about 75 times the prices paid in the early 1860s. So, for example, a bullock that cost Thomas £4 to buy in 1863 would cost him today about £300. 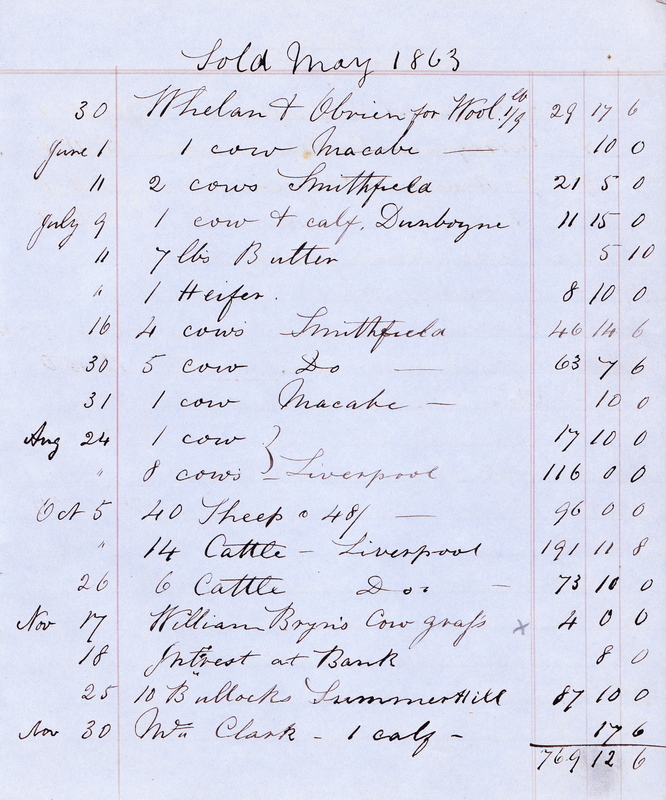 Of course, these conversions to today’s value are only approximate but I hope they will give you some idea of the scale of livestock trading that Thomas Smith undertook in his first couple of years at Blackhall. 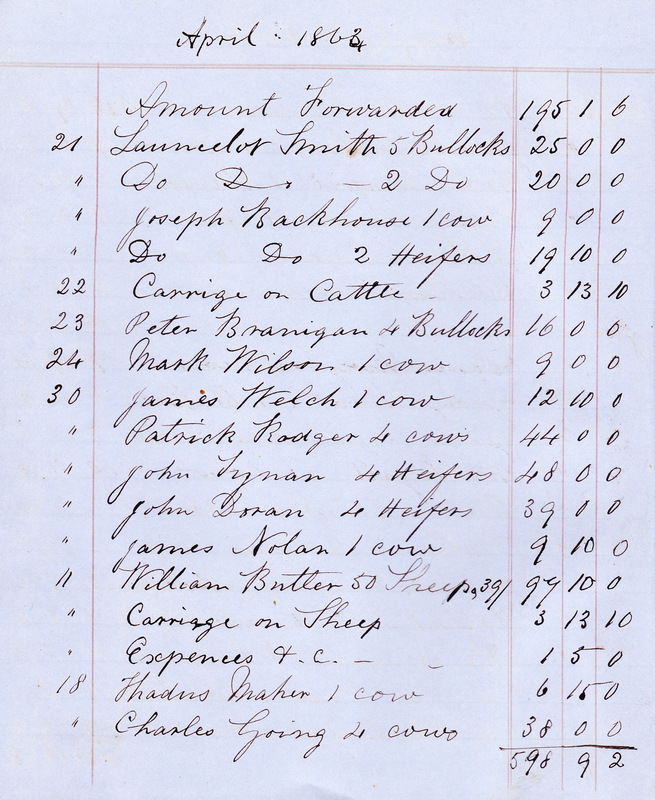 The Blackhall account book describes all the livestock (cattle, sheep, a few pigs and a few horses) that were bought. 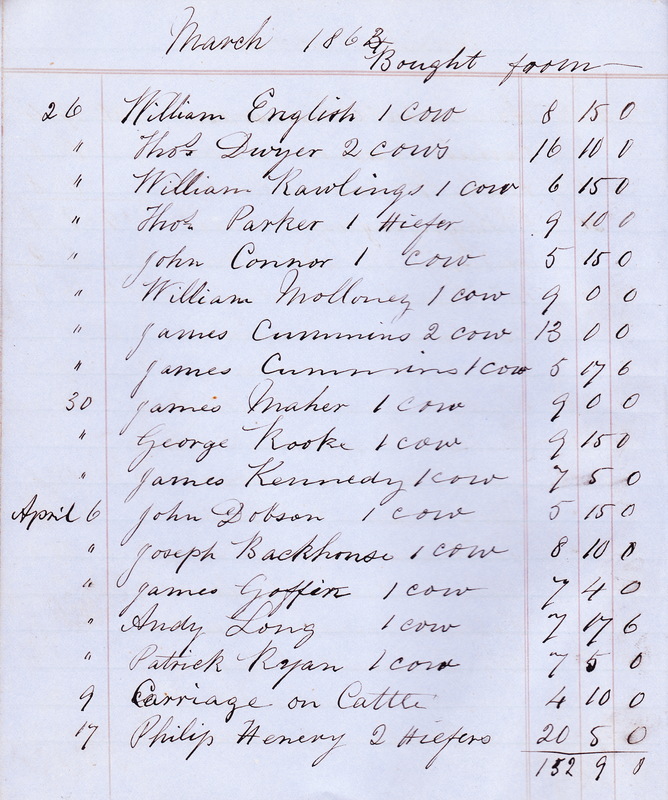 From 26 March to 8 November 1863, £912 16s 9d (about £68,500 today) was spent on buying the livestock. For the full year of 1864, the livestock bought cost £1,892 10s 7d (about £142,000 today). Most of the livestock that Thomas Smith bought in 1863 was cattle – cows, heifers and bullocks. 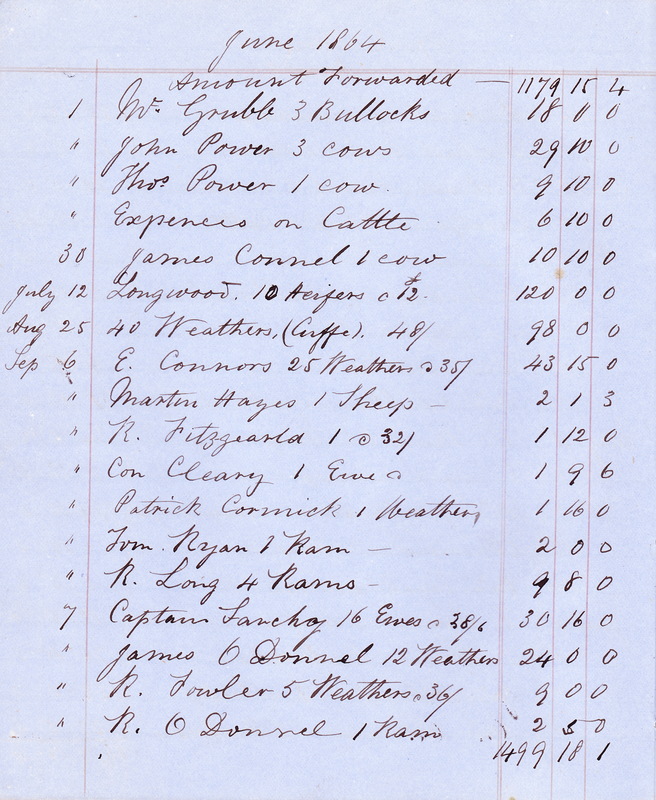 From the frequent pattern of the purchases – up to ten in the same day – I am guessing that Thomas was going to towns that had livestock sales in what were called “fair days” and buying one or more animals from different sellers, then having the animals transported to his farm in County Meath. 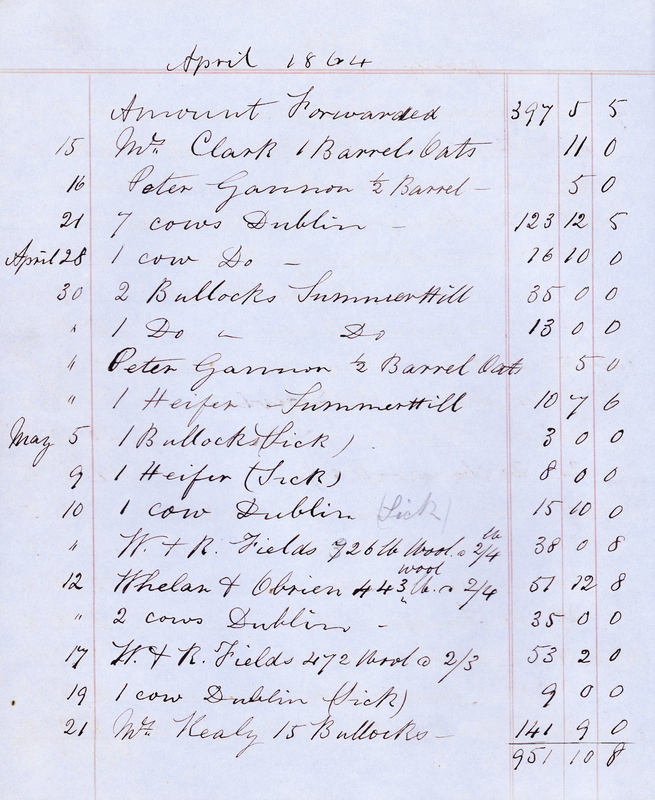 Judging by the cost of transporting (“carriage”) livestock on or close to the same date as a number of livestock purchases, I think much of the buying was done away from County Meath and I believe most of that was done in County Tipperary, especially at the beginning. On the first page of the entries, even before he had possession of Blackhall, Thomas bought a number of cows and one heifer. One of the sellers is interesting: Joseph Backhouse, who was married to Thomas Smith’s sister Hannah and lived in Tipperary. So I assume that all the purchases on 26 and 30 of March were made in Tipperary, probably in the town of Cashel. The cost of transporting the animals was paid on 9 April. They would probably be the first livestock brought to the farm by Thomas. On 21 April, Thomas bought 7 bullocks from “Launcelot Smith”, who was his brother – then living near Cashel. He also bought more animals from Joseph Backhouse on the same day so those two purchases were made in or near Cashel. On 11 May, Thomas bought 50 sheep and had them transported, presumably to Blackhall. Thomas continued to buy livestock quite actively until 9 June, after which there were only a few purchases, written out of date order at the end of the year. 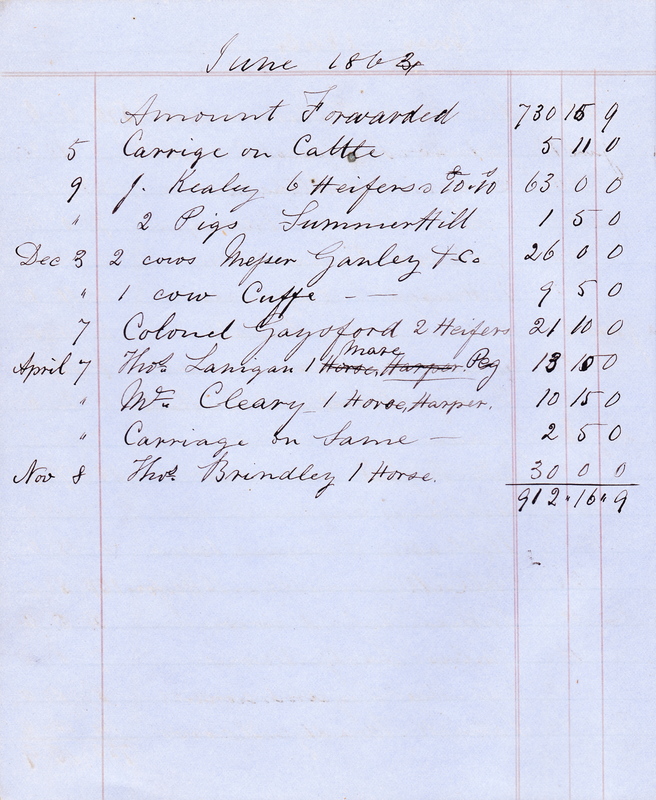 One purchase on 8 November was of a horse from Thomas Brindley, who was living in Tipperary near Cashel. Thomas Brindley was the father of Caroline Brindley who married Thomas Smith’s younger brother William in 1864. 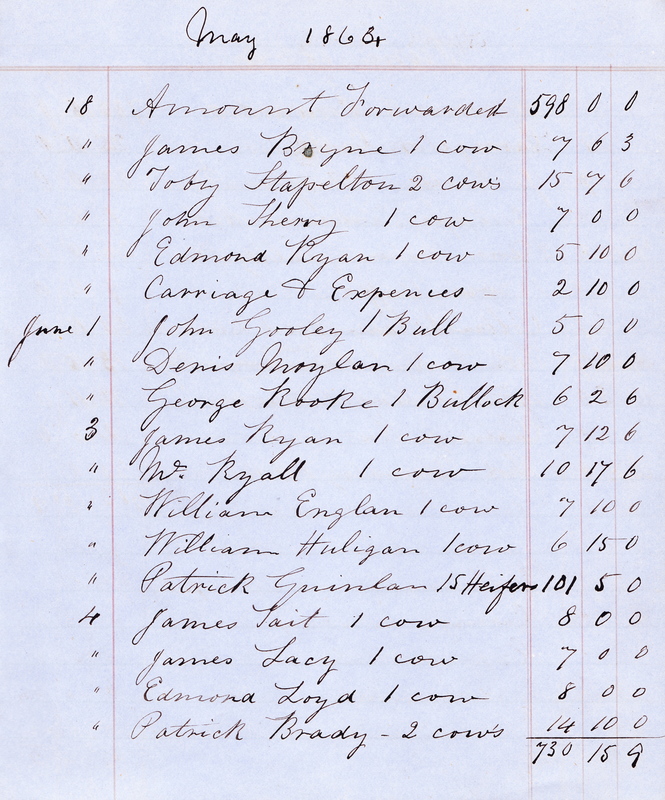 Another purchase was on 7 December of two heifers from Colonel Gaysford, who was a prominent landowner and farmer in County Meath and was known to Thomas Smith because they were both members of the same Anglican parish of Ballymaglasson. It is odd that no livestock was bought between 9 June and 8 November in 1863. Maybe Thomas had enough livestock on hand and wanted to sell some of those before buying any more. Or there could have been other reasons, such as: lack of cash, lack of enough suitable pasturage at the farm, or a poor market for livestock in Dublin that year. In 1864, Thomas Smith was buying livestock throughout the year at double the volume of the previous year. As well as cows, heifers and bullocks, he also bought 422 sheep (ewes, wethers, hoggets and rams), 2 pigs and 2 horses. 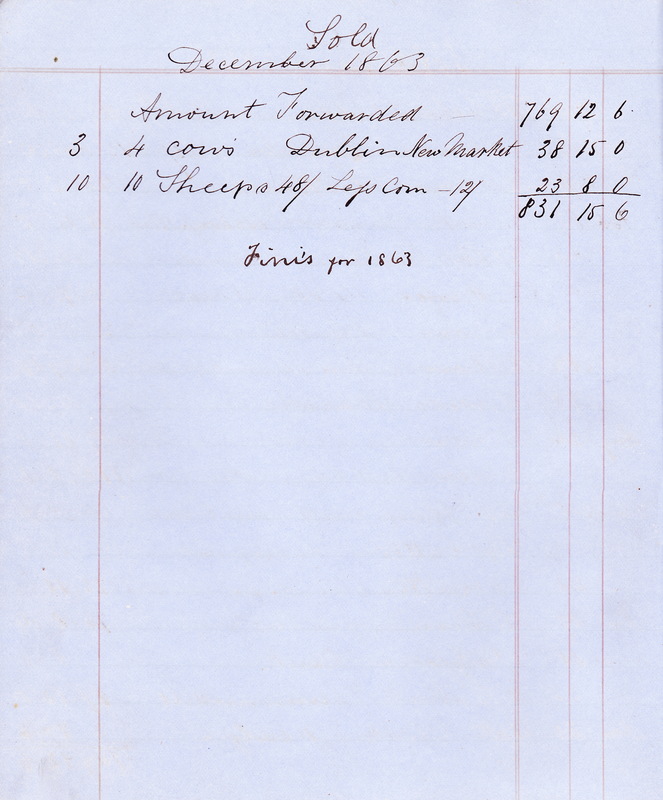 Besides listing what animals were bought, the entries in the account book also give the seller’s name in most cases. Some sellers only have an initial before the surname, some get the full first name and a few get Mr., Captain or some other title. Even in such a simple listing, it seems social standing had to be noted. Again, as in 1863, there were a number of purchases of livestock made on the same day and there were transportation costs associated with them so I assume they were made away from the Blackhall area at the “fair days”. The accounts also list all the livestock and other farm products sold in 1863 starting on 30 May and going to 10 December. This section took only two pages in the book. Livestock sold that year was mainly cattle but also included some wool, sheep, butter and cow grass. This section of the accounts also included (as income) some interest received from a bank. The total in the “sold” section for 1863 was £831 15s 6d (about £62,400 today). Sales took place at Smithfield (in Dublin), Dublin New Market, Dunboyne and Summerhill (both near Blackhall), and Liverpool. In 1864, the livestock sold was worth £2,584 1s 8½d (£194,000 today), more than three times the volume of 1863. Thomas had other things to sell in 1864, in addition to cattle. There were a few odd items like 3 pounds of butter, a cow hide, a bullock hide and some horse grass. He also sold quite a few barrels of wheat and oats, much of it in small quantities to his employees, among others. He sold cattle in small numbers both in Summerhill and in Dublin. A number of the cattle he sold individually were sick. Wool was a significant item for sale. 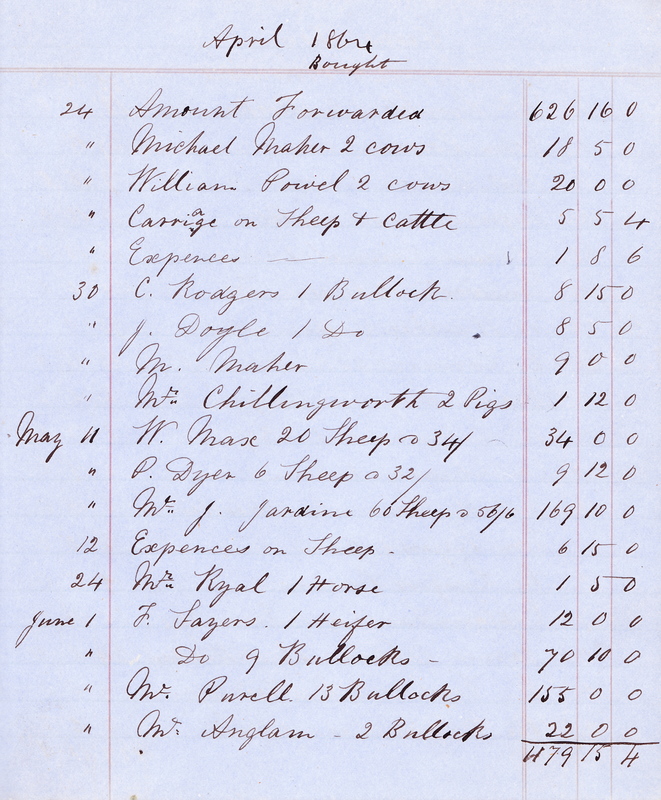 W & R Fields and Whelan & O’Brien were the purchasers of more than 1,600 pounds of wool in May 1864. In August 1864 a new pattern of selling was established; sheep and cattle were mostly sold in groups with the notation “less com”, meaning less commission. I assume this meant he was using an auctioneer in Dublin to sell his animals for him. Most sales of animals in or after August were of this type although he still sold a few animals himself in Summerhill and Dublin. I wonder was it in 1864 or soon after when the Smith, Griffin company was established to deal in cattle sales and wool factoring? This entry was posted in Blackhall, Smith and tagged Blackhall, Farm Accounts, Thomas Smith. Bookmark the permalink.